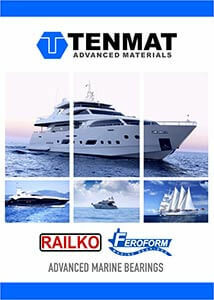 For more than 50 years, TENMAT have been manufacturing advanced composite materials for the marine market and supplying over 8000 vessels with high quality FEROFORM and RAILKO bearings on both commercial and military vessels operating in the harshest environments and giving excellent performance. FEROFORM and RAILKO bearings work with any type of water, run with smaller clearances than elastomeric bearings, are dimensionally and thermally more stable, and have superior wear resistance. Independent tests confirm that TENMAT materials have a significantly better wear resistance than elastomeric and polyester / polyester bearing materials from our major competitors. 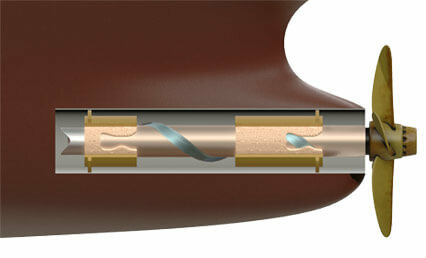 Thus providing ship owners with up to 4 times longer service life and lower operating costs. Bulkers, tankers, cruise ships, yachts and many other commercial ships, have chosen TENMAT bearings for stern tube and propeller shaft application because of its longer operational life, lower operational costs and its ability to work in sediment rich waters and the harshest environments. 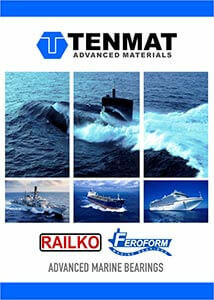 TENMAT is the trusted supplier to major navies worldwide. Over 35 navies specify FEROFORM and RAILKO for safety critical applications where their excellent performance, in abrasive conditions, offer the best combination of durability, low friction and low wear rates in the market place. DOWNLOAD MARINE BROCHURE – TURKEY LANG. DOWNLOAD MARINE BROCHURE – SPANISH LANG. DOWNLOAD MARINE BROCHURE – JAPANESE LANG. DOWNLOAD MARINE BROCHURE – GERMAN LANG. DOWNLOAD MARINE BROCHURE -FRENCH LANG. DOWNLOAD MARINE BROCHURE – CHINESE LANG.